traditional ideas and create new ideas, forms and methods in our evolving world. Barbara created the meditations for Children because she knows how important it is for children, especially the sensitive ones, to be able to manage their own energy. Fears, worry and being overly concerned about the things that cannot be controlled will diminish a child’s energy field, but by creating positive thoughts and feelings they can easily learn to shift their energy from fear to love. Learning to manage their energy will have positive effects on the child’s mental, emotional and physical well being. Adults often tell children to "calm down! ", but have they been given the tools to accomplish this? What does it mean? 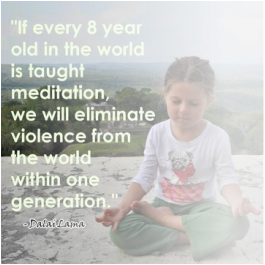 We can accomplished calming by teaching child how to breathe deeply, ground and centre. In the guided meditations on the downloadable Children's Meditation CD, the child journeys with the narrator to learn techniques for calming the mind, grounding, enhancing self esteem and creating an all over sense of well being. It teaches the child how to become the master of their own thoughts and feelings. By listening to the guided meditations on a regular basis an agitated or anxious child will soon become more relaxed and comfortable. The meditations are simple and short and once a regular practice is established the child may wish to progress to doing their own silent meditations. The "Meditations for Children" CD is available to download from the Products page of this website.